Democrat Hillary Clinton campaigns in Monticello. Democratic presidential candidate Hillary Clinton defended educators and the controversial “common core” standards for America’s schools during her first 2016 campaign stop in Iowa on Tuesday. “I just want us to trust and respect especially our teachers again so that we can get to where we need to go,” Clinton said. Clinton met with a small group of students and educators at a community college center in Monticello yesterday. 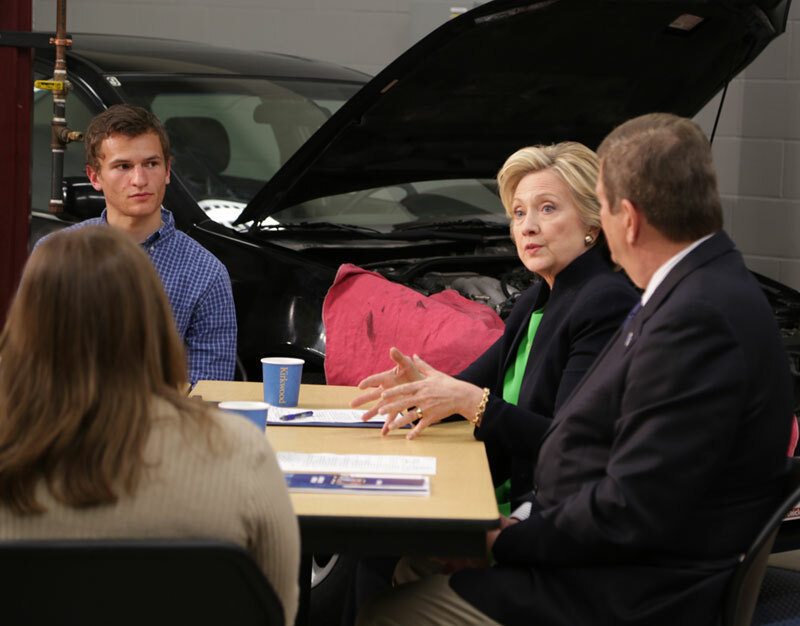 The event was staged inside an auto tech lab for students at a Kirkwood Community College center in Monticello. One of the instructors who participated in the roundtable discussion lamented the attacks on “common core” standards for schools. Clinton called the attacks from many in the Republican presidential field “very painful” to hear, since the “common core” effort had started as a “non-partisan” agreement among the nation’s governors. Clinton closed the 90-minute event by speaking about her decision to seek the presidency. Read Radio Iowa’s previous story about Clinton’s appearance in Monticello. Clinton will hold another roundtable discussion with central Iowa small business owners late this morning in Norwalk.